Thanks to the Hitachi CP-X308's built-in networking feature, users can monitor and manage one or more projectors from a single remote location, using Hitachi's proprietary PJ Man software. This simplifies the control, maintenance and security issues inherent with any projector system. Users can easily monitor the status of the projector (or many projectors), as power on/off, input source, lamp/filter hours and condition are all on display. Moreover, the software allows for control over these functions. Additionally, users can schedule power on/off events on an hourly, daily and weekly basis. 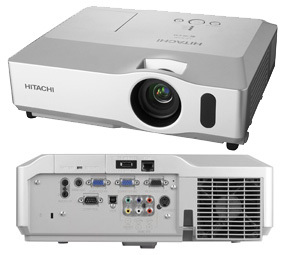 Events can be applied to an individual or group of Hitachi projectors. Other features such as e-mail alerts for scheduled maintenance or error conditions, as well as password protection, give the user a new level of control at no extra charge. The CP-X308 boasts 2,600 ANSI lumens of brightness and native XGA resolution at a light weight of 8.8 pounds. The CP-X308 features 802.11 b/g connectivity, allowing up to four PC’s to connect wirelessly. The CP-X308 also offers a variety of wired connectivity options, including component, composite and S-Video inputs, as well as two RGB inputs and one RGB output.